If you find the Elf on the Sh*lf phenomenon a bit annoying, or you just enjoy torturing your husband, you need to go check out a blog I recently ran across. The run down is a wife found her husband's weakness, a dislike/fear of those creepy little elves to whom entire websites and pinterest boards are dedicated. She is blogging her adventures with her own version of the elf. Is there something wrong with me? Because I laughed until I cried. I guess I have a warped sense of humor. 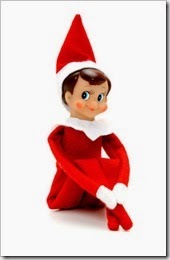 .....if you are in the market for a creepy elf, it appears eb*y is flush with them! Oh my, I HATE Chucky the Elf! (what I've named every single Elf on the Shelf doll) What an awful tradition! But then again we don't do Santa so it's all rather pointless. Just one more "thing" for parents to do during the Christmas season. Although I did wish I had one last week so I could've "made" my St. Nicholas figuring slap him as if he was Arius. Or is that taking it too far? ?